Nigel’s story – Nigel died in January this year (2018). He was found by the DOC ranger, Chris Bell, on the nest he had built for his concrete mate. Nigel had wooed for more than two years, since his arrival on the island in late 2015. 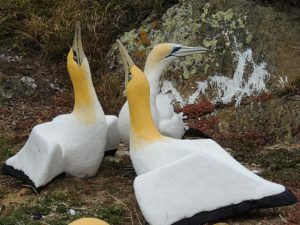 His death came just a few weeks after three other gannets were spotted frequenting the concrete gannet colony, near Nigel but not in his spot so they didn’t socialise together. Nigel’s unrequited love and untimely death became an international story with news outlets from around the world contacting FOMI and DOC for interviews, photos and video footage. 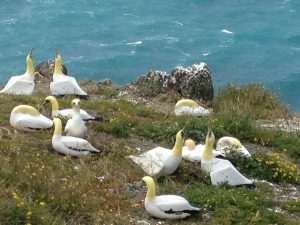 Suddenly Mana Island, Nigel, and the concrete gannet colony were in the spotlight. There was an outpouring of affection for Nigel on social media. Nigel had poems written about him, people did drawings, and his concrete mate gained a name, ‘Connie’. Ranger, Chris Bell, was kept very busy with telling his story to journalists, and our vice-president Linda Kerkmeester was also interviewed on BBC World Service and ABC Radio Australia talking about FOMI’s connection to the gannet colony project. Nigel became famous, and the knock-on effect was a sharp rise in our Facebook followers, many more visits to our website, and an increased understanding of the restoration work being undertaken on Mana Island. See short video clips of Nigel on our You Tube channel. Read some of the international coverage in the New York Times, The Guardian, the Evening Standard, BBC News. A song written for Nigel – by Dainius Kucinskas, 24 year old guy from Vilnius, Lithuania. DOC blog about Nigel – “The gannet who stole our heart”, published on Valentine’s Day. Radio interview about Nigel with DOC ranger Chris Bell. But only Norman dropped on by. We weeded, we painted, we sprayed guano around. We hoped you’d find the real thing. But suddenly you are gone. Her mango sundress, easy on the eyes. The nest Nigel built of twigs, sticks and plum. Matted feathers, to fix, tussle and groom. Given honest and freely, no recompense owed. Out past the break, over the horizon. He is survived by his immortal mate. Connie, his concrete love, his gorgeous date. His love will forever shape this island. Poem for Nigel, by Marcia Smithen Cohen, Florida, USA. 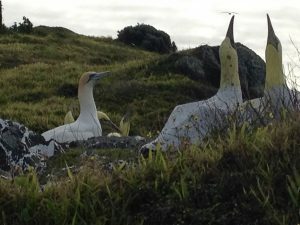 a task for each gannet male. she’d give in, soon or late. ever, to become his bride. but still hoping, our gannet boy. and Nigel hardly left her side. united with his dream bride. Lived a bird who had a beau. One quiet beauty caught his eye. Her strong grey beak raised to the sky. Build his love the finest nest. Sang her songs of tenderness. Kept her eye fixed to the sky. Come! they sang, come join our flock! Buzz off! he cried, don’t scare my bride. She could never love him so. Sad, it was he did not know. Stony eye fixed on their bed. Cold as stone, as cold can be.